So, Jesus died because laying down his life was the greatest form of love. For whom? His friends. Who are his friends? Those who obey his word, which will never become irrelevant (Mark 13:31.) Jesus' death was the ultimate fulfillment of his ministry of love, compassion and self-sacrifice. This is Godly simplicity! And yet men want to make more, and at the same time, less, of the life, teachings and sufferings of God's Spokesman and our chosen example, Jesus. Therefore, when Jesus says "It is finished" on the cross (John 19:30) it cannot possibly mean that our requirement to do Good Works is finished, or that our need to go to God to seek forgiveness is finished, or that our duties to serve others is finished. It cannot ever mean any of those things, or Jesus' ministry was in vain. Let us remain always his friends by seeking to always follow his teachings. Let us not make his death be in vain! Our Savior makes a sincere repentance of all past sins, and universal obedience to the divine will, necessary to our salvation. It would not become Jesus' holy Father to receive us into His favor upon other terms; and holiness is in itself so necessary to render men truly happy, that without it, they cannot enjoy themselves, nor be prepared for a state of perfect happiness. When he sent his apostles to preach the Gospel, he enjoined them to teach those whom they baptized, “to observe all things whatsoever he had commanded them.” (Matt. 28:20) - a commission they faithfully executed. We must consider the case of those who hope to be saved by their faith in Jesus Christ, though they are destitute of those good works in which God has ordained, and in which, we should walk. The Apostle James shows them that as it would be a pretense for someone to say he loved his brother, if he did not manifest his love by kind actions; so it would be mere presumption for anyone to rely upon their faith, if it was not producing good works. “Works” here intended are undoubtedly Good Works, done in obedience to the will of God, and proceeding from faith in Christ Jesus; and he principally intends works of charity and mercy. Some will therefore be most unhappily disappointed, who flatter themselves with the hope of heaven, because they believe in Christ, and rely upon his merits, but do not reform their lives. And yet is not this the unhappy condition of many Christians? 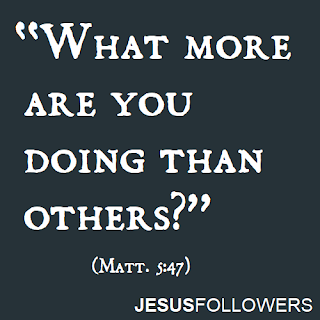 For all hope to be saved by Jesus Christ, but few live in conformity to his precepts and example. There are many things indeed, which are esteemed good works by some Christians, but are far from deserving this name; because they are contrary to the moral precepts of the Gospel, or have not the authority of Christ stamped upon them. Observing all his commandments, according to the best of our knowledge and ability is necessary to our acceptance with him. We must not therefore content ourselves with doing some good things, while we live in the willful omission of other known duties. We should imitate our blessed Savior, who fulfilled all righteousness, who did not only pray to his heavenly Father, but also went about doing good to all men; and, by submitting to John's baptism, has taught us to lay due stress upon every commandment of God. The discourse of our Master of which these words are a part was addressed to his first followers, and especially those who were afterwards Apostles, and preachers of the gospel. In it, he explains what was their proper character, their station, and their duty; setting them in as striking a light as possible. "You," he says, "are the salt of the earth, the light of the world, and a city set upon a hill." They were to be the public instructors of mankind, ambassadors, as it were, from God, sent by him for the great purpose of persuading a sinful world to abandon their vices, and sinful customs, and to devote themselves to a life of virtue, with a view towards a happy immortality. It was expected that they should be examples to others, that their lives might illustrate their doctrine. As they were supposed to know more than others, so it would be reasonably expected that they should do more than others. And in what ways our Master’s disciples should seek to outdo others, he tells them; and the instances he mentions are indeed most worthy of our ambition. Namely, to strive to carry the generous virtues of benevolence, forgiveness of injuries, and the desire to live useful lives, to the greatest height. To act in this manner with such true greatness of mind, and disinterested benevolence, is to act the part that the almighty and infinitely benevolent maker of all things continually acts, it is to be as the sons of God, doing the work of our heavenly father. Could a nobler principle or a nobler cause of action be proposed to mankind or could they be enforced by a more powerful and worthy motive. To be governed by these principles, and to act in this manner is to approach as near to the sentiments and conduct of Divinity, as is permitted to mortals. The religion of Christ lays us under obligation to live as he did, to resemble him in the temper our minds, and the course of our conduct, to obey his commands, and to copy his example, is to confess him before men, and such only as confess him in this manner, will he confess, and acknowledge to be his, before his heavenly Father. Are we trained up in the sound belief that nothing but a good heart and an exemplary life are pleasing to Almighty God, and will recommend us to his favor and acceptance? Is this our faith? So pure and spiritual a profession lays us under obligations to live lives in the highest degree pure and spiritual, worthy of a pure and undefiled religion. The end [goal] of all knowledge is practice, and it would ill become us to show the zeal that we do by forming ourselves into separate societies, and being at the expense of supporting them, by which we hold out to the world our idea of their importance, if we thought they were merely matters of speculation, and had no connection with moral duty. Let our lives be as pure, as our sentiments, equally worthy of God and of Christ, and we shall be indeed the light. of the world, the salt of the earth, and a city that is set upon a hill. Let us not be ashamed of our good confession. I trust we are bearing a public testimony in favor of the purity of. the worship of the one true God, amidst a corrupt and idolatrous generation. Let all those persons who are possessed of whatever themselves and the world consider as advantages, ask themselves what they do more than others, who are lacking them. Better for us to be poor, than to be rich and not generous; to be fools, than to be knaves; and to have been taught nothing at all, than to make a bad use of superior knowledge. It would have been better for us never to have heard of Christ than to be Christians in name only, and not in deed and in truth. 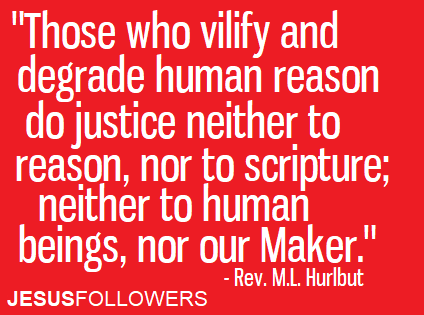 God has never enjoined on human beings the duty of believing without evidence. He has never addressed us other than as rational beings, capable of discerning between truth and falsehood, and expected to do so on our own responsibility. Revelation came not to supersede reason, or to set aside its deductions; but to enlighten its course, to expand its views, to enlarge its field of action, to dispel the earth-born mists that obscured its vision, to give it broader and more solid premises, on which to build its conclusions, and to prep its wings for a higher flight. It never calls for the subjection of reason - the 'prostration' of the understanding, to its dictates. On the contrary, it is itself subjected to the decision of reason; and must abide the test. It must be received or rejected according to the dictates of our sober judgment on the evidence presented. And as with the evidence on which it rests, so with the doctrines it contains. These too, are subjected to the test of reason. We believe them just in so far as we understand them; and no farther. The provinces of faith and reason are not distinct, the one beginning where the other ends. They cover the same ground. It seems to us a mere identical proposition to state that what is not understood, cannot be believed. In this case no object is presented to the mind for it to receive or reject. What is not understood is to me no revelation. If a man say that he believes what he does not pretend either to explain or comprehend, he deceives himself. His faith is merely verbal and illusory. Doubtless there may be many truths both in nature and in scripture, of which we are ignorant. But to us, so long as we remain ignorant of them, they are nothing - they are to us as though they did not exist. We pretend not to comprehend the nature and perfections of the Divine Being, for example; but in so far as they are displayed, they are perfectly plain and intelligible - 'he that runs may read them.' And what is not displayed is no concern of ours. My eye cannot penetrate the deep infinitude of the space that surrounds me; but within the verge of my own horizon I can see clearly, and move freely. Let it not be said that we exalt reason at the expense of revelation. We do but assign to each its appropriate sphere. Reason, we must admit, was weak and inefficient by itself. And why? It lacked authority to still the clamor of the passions, that disturbed its operations. It lacked facts to render its conclusions certain. Above all, it wanted sanctions to bind them on the conscience. All this revelation has supplied; and thus, it has completed the system of God's dispensations to humanity. 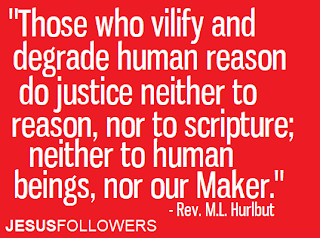 Those who vilify and degrade human reason; representing it as corrupt and debased; cautioning us continually against trusting to its guidance, and making it the test of a docile and humble spirit, and urging us to embrace doctrines from which reason recoils; do justice neither to reason, nor to scripture; neither to human beings, nor our Maker. 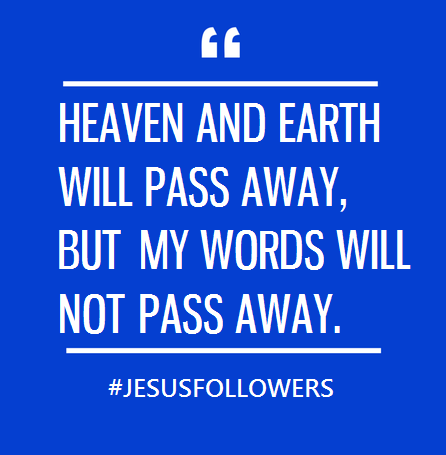 Jesus says his words shall never pass away. Yet at first sight nothing seems more fleeting than a word. It is an evanescent impulse of the most fickle element. It leaves no track where it went through the air. Yet to this, and this only, did Jesus entrust the truth for the salvation of the world. He took no pains to perpetuate his thoughts; they were poured forth where occasion found him an audience - by the side of the lake, or a well; in a cottage, or the temple; in a fisher’s boat, or the synagogue of the Jews. He did not even write his words in a book. With a noble confidence, the result of his abiding faith, he scattered them broadcast on the world, leaving the seed to its own vitality. Looking at the Word of Jesus, at real Christianity, the pure religion he taught, nothing appears more fixed and certain. Its influence widens as light extends; it deepens as the nations grow wiser. But, looking at the history of what men call Christianity, nothing seems more uncertain and perishable. In actual Christianity, there seem to have been, ever since the time of its earthly founder, two elements, the one transient, the other permanent. The one is the thought, the folly, the uncertain wisdom, the theological notions, the impiety of man; the other, the eternal truth of God. Transient things form a great part of what is commonly taught as Religion. An undue place has often been assigned to forms and doctrines, while too little stress has been laid on the divine life of the soul, love to God, and love to man. Religious forms may be useful and beautiful. They are so, whenever they speak to the soul, and answer a want of it. Anyone who traces the history of what is called Christianity, will see that nothing changes more from age to age than the doctrines taught as Christian, and insisted on as essential to Christianity and personal salvation. What is falsehood in one province passes for truth in another. The heresy of one age is the orthodox belief and “only infallible rule” of the next. Since these notions are so fleeting, why need we accept the commandment of men, as the doctrine of God? Doubtless the time will come when men shall see Christ Jesus also as he is. 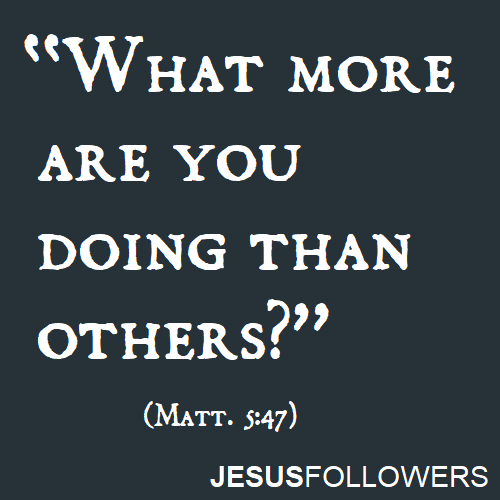 Well might he still say: “Have I been so long with you, and yet hast thou not known me?” No! we have made him an idol, have bowed the knee before him, saying, “Hail, king of the Jews;” called him “Lord, Lord!” but done not the things which he said. Truth will triumph at the last, and then we shall see the Son of God as he is. 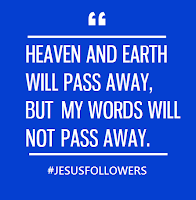 Then will men understand the Word of Jesus, which shall not pass away. Measure him by the best of men, how little and low they appear. Exalt him as much as we may, we shall yet, perhaps, come short of the mark. But still, was he not our brother; the son of man, like ourselves? His excellence, was it not human excellence? His wisdom, love, piety - sweet and celestial as they were - are they not what we also may attain? But if, as some early Christians began to do, you take a heathen view, and make him a God, the Son of God in a peculiar and exclusive sense - much of the significance of his character is gone. His virtue has no merit; his love no feeling; his cross, no burden; his agony no pain. His death is an illusion; his resurrection but a show. For if he were not a man, but a god, what are all these things; what his words, his life, his excellence of achievement? It is all nothing, weighed against the inimitable greatness of Him who created the worlds and fills up all time and space! Then his resignation is no lesson; his life no model – to we, who are not gods, but mortal men. While one generation of opinions passes away, and another rises up; Christianity itself, that pure Religion, which exists eternal in the constitution of the soul and the mind or God, is always the same. This truth we owe to God; the revelation of it to Jesus, our elder brother, God’s chosen son. Come to the plain words of Jesus of Nazareth, and Christianity is a simple thing; very simple. It is absolute, pure Morality; absolute, pure Religion; the love of man; the love of God acting without let or hindrance. The only creed it lays down is the great truth which springs up spontaneous in the holy heart: there is a God. Its watchword is, be perfect as your Father in Heaven. Compare the simpleness of Christianity, as Jesus sets it forth on the Mount, with what is sometimes taught and accepted in that honored name; and what a difference! One is of God; one is of man. There is something in Christianity which sects have not reached; something that will not be won by theological battles, or the quarrels of pious men. The Christianity of sects, of the pulpit, of society, is ephemeral - a transitory fly. It will pass off and be forgot. Some new form will take its place, suited to the aspect of the changing times. That pure ideal Religion which Jesus saw on the mount of his vision, and lived out in the lowly life of a Galilean peasant; which transforms his cross into an emblem of all that is holiest on earth; which makes sacred the ground he trod, and is dearest to the best of men, most true to what is truest in them, cannot pass away. His words and example passed into the world, and can no more perish than the stars be wiped out of the sky. The truths he taught; his doctrines respecting man and God; the relation between man and man, and man and God, with the duties that grow out of that relation, are always the same, and can never change till man ceases to be man, and creation vanishes into nothing.